Panhandle Public Health District (PPHD) is accredited by the Public Health Accreditation Board (PHAB), which requires the health department to conduct a comprehensive Nebraska Panhandle Community Health Needs Assessment (CHNA) every five years. However, Internal Revenue Service (IRS) regulations require tax-exempt hospitals to conduct a CHNA every three years. In 2014, PPHD made the decision to collaborate with hospitals on the CHNA process by syncing the health department process with the hospital process, meaning that PPHD completes a CHNA every three years, in tandem with area hospitals. Thus, PPHD now facilitates a joint CHNA and planning process with the eight hospitals in the Nebraska Panhandle, all of which are members of the Rural Nebraska Healthcare Network (RNHN). 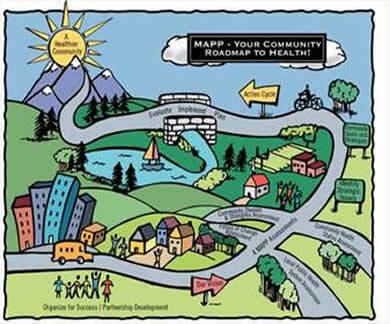 The purpose of the CHNA process is to describe the current health status of the community, identify and prioritize health issues, better understand the range of factors that can impact health, and identify assets and resources that can be mobilized to improve the health of the community. Mobilizing for Action through Planning and Partnerships (MAPP), a partnership-based framework, has been used for the CHNA and Community Health Improvement Plan (CHIP) development process in the Panhandle since 2011, and continued to be used for this round of the CHNA and CHIP. MAPP emphasizes the partnership with all sectors of the public health system to evaluate the health status of the region it serves, identify priority areas, and develop plans for implementation. Panhandle Public Health District is working together to improve the health, safety and quality of life for all who live, learn, work and play in the Panhandle. Our vision is that we are a healthier and safer Panhandle Community. MAPP priority meetings are happening accross the Panhandle. PPHD is looking for a Preparedness Community Health Educator. Copyright 2017. Panhandle Public Health District. All Rights Reserved.